The keyword for the January challenge over at CAS watercolour is snowflake and there are a few days left to participate. I have very simple looking cards to share but they are not quite so simple to make. There is a bit of trial and error involved in order to avoid a colourful mess. 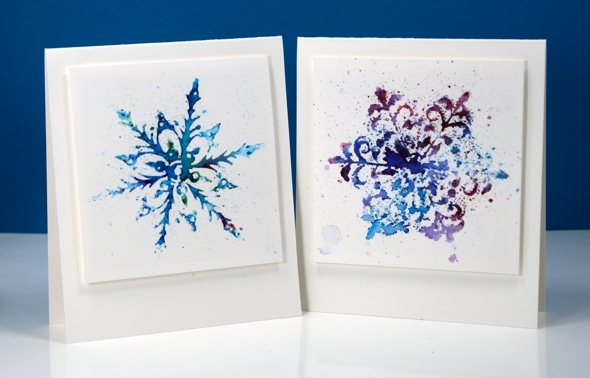 To create these two little cards I used what I like to call the ‘water stamping technique’. I stamped with only water then lightly sprinkled colorburst powder over the water stamped image. I left it alone to dry then shook off any extra powder that hadn’t been activated by the water. The problem comes when you have too little or too much water. Too little gives you an incomplete image, too much and you get a mess! I applied water to my stamp with a paint brush rather than a spritzer and stamped on watercolour paper. It’s a fun technique to try and won’t really deplete your supply of materials too much! I’ve tried stamping with water and it’s so hard to get just the right amount! These snowflakes are AMAZING, Heather! Love how crisp their shapes are and the gorgeous colors! Thanks so much for sharing them with us at CAS Watercolour! Love this technique Heather and the simplicity is beautiful! Gorgeous snowflake…will have to give this technique a try!!! Oh my, I’ve been meaning to try this, and I’m even more determined after seeing your cards. They look absolutely amazing! Beautiful cards! I can see that this technique could be tricky… I am going to have to try it. Heather, this is CAS perfection! I love the technique you used and will have to try it. You achieved two beautiful colour variations. Thanks so much for joining us at CAS Watercolour! Your snowflakes are so gorgeous Heather!! What a wonderful technique and thanks for all the tips. I’m definitely going to try this. And thanks for sharing with us at CAS Watercolour! These are gorgeous – off to give this technique a try! Thank you so much! I Love your CAS design Heather and appreciate you sharing your technique. I would love to try it . Your snowflakes are really stunning. TFS and joining us at CAS Watercolour. Hugs..
Beautiful! Oh the patience it must have taken to let it dry! This is awesome. I have such trouble using powder inks and then you take it up a few notches and made beautiful cards. And congrats on being CAS Watercolour top pick for the month.